To be sure, the limited partners like pension fund managers who invest in private equity funds, are still keen on Africa, total PE fundraising for Africa-focused funds was up to $2.7 billion from $2.4 billion in 2017. But these numbers are down from recent highs of $3.4 billion (2016) and $4.5 billion (2015). There’s growing demand for consultants working on getting the internal processes and finances of local privately-owned businesses into shape for potential investor interest. But even when these private companies meet due diligence standards, many are still too small for large PE players. Another approach is one with blue chip PE fund TPG Growth, which has backed a smaller specialist investment firm called Kupanda Capital. Kupanda, which is focused on the African market, has made a venture investment in a consumer data startup called Fraym but also a high-profile PE-style investment in Maven Records, Nigeria’s leading independent label, owned by Afrobeats star producer, Don Jazzy. You could say it’s small change in tune for a bigger hit. The ET 302 tragedy is testing Ethiopian Airlines’ six-decade long relationship with Boeing. Since 1960, Boeing has been instrumental in helping Ethiopian Airlines build a young and modern fleet that propelled its global ambitions. But as scrutiny over the safety of the Boeing 737 Max 8 model intensifies, Abdi Latif Dahir reports on the concerns over not only how the two companies’ relationship will farebut also what this means for Ethiopian’s immediate and long-term future. The Ethiopian king who shot himself rather than be captured by the British. The stolen locks of the king, who shot himself rather than be captured by an invading British army in the mid-1860s, was recently declared to be returning home. As Mohammed Girma writes, the stolen hair represents a crucial part of the Horn of Africa nation’s projection both at home and globally. What makes Africa’s largest e-commerce platform African? Jumia’s filing to launch its initial public offering on the New York Stock Exchange has stirred questions about what defines a startup as African. Like a growing number of flagship companies in Africa’s tech ecosystem, Jumia is incorporated outside the continent with much of the company’s, investors, founders, top management and technical leadership not originally from the continent either, Yomi Kazeem writes. South Africa is now a major hub for big tech’s cloud data centers.Amazon, Microsoft and Huawei have opened up major data centers in South Africa in recent months. While having their cloud strategy extended to Africa’s most advanced economy seems like a no-brainer, Toby Shapshak explains these data hubs could be a turning point for an economy getting through a difficult period. Photos: The devastation of Cyclone Idai wiped out nearly an entire city in Mozambique. It has been more than a week after the massive storm made landfall—tearing through Mozambique and Zimbabwe and flooding Malawi—and the extent of the damage is still unfolding. Hardest hit, Mozambique’s fourth largest city Beira resembles an inland lake, with surrounding villages completely submerged. South Africa’s Human Rights celebrations ignore the man who fought for it. Post-apartheid South Africa has learned to turn the most painful moments of its history into lessons for the present, yet the pomp and fanfare that now accompanies these anniversaries also threatens to whitewash history, writes Lynsey Chutel. Celebrating Human Rights Day, and commemorating the 1960 Sharpeville Massacre, the day has forgotten the man who led the protest, struggle icon Robert Sobukwe. 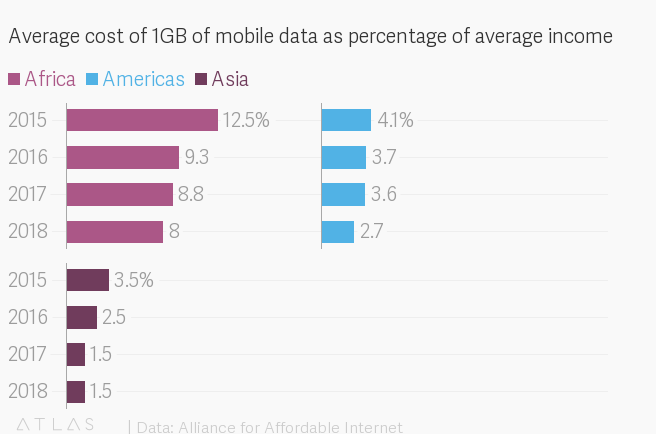 The cost of internet access dropped everywhere in the world last year—except in Africa. The average price of a gigabyte of data relative to monthly income increased in Africa over the past year while dropping or staying the same in other regions. Indeed, in sixteen countries across Africa, purchasing a gigabyte of mobile data costs more than 10% of the monthly average income—much higher than the recommended affordability threshold of 2%. Why a China-built internet is better than no internet in Africa. Even as the US sounds security concerns over the Chinese multinational Huawei’s tech infrastructure, the company has made crucial roads in Africa, reportedly building about 70% of the continent’s 4G networks. For Foreign Policy, Amy Mackinnon explains why the greater need for internet access is pushing governments to invite in China. Leapfrogging isn’t working in Africa and other frontier markets. In this Center for Global Development paper by Bright Simons, he examines why many of the issues around the innovation narrative in Africa are not delivering on their promise even though we often hear they are. Simons argues the challenge goes beyond inadequate infrastructure, weak institutions and poor funding and digs a bit deeper. Africa CEO Forum 2019 (Mar. 25-26). Leading business leaders along with 1,500 participants will converge in the Rwandan capital, Kigali to discuss intra-African trade, regional integration, and mobilizing private sector. AfriLabs learning week (Mar. 25-29). The pan-African network of over 100 innovation and tech hubs will kickstart virtual training workshops to boost management and incubation skills among founders and staff. Pope Francis to visit Morocco (Mar. 30-31). The Catholic church leader’s agenda will focus on migration, given the North African state is a key transit point for immigrants trying to reach Europe, besides freedom for Christian worshippers in the Muslim-majority nation. *This brief was produced while listening to Canon by Awilo Longomba (DR Congo). Our best wishes for a productive and thought-filled week ahead. Please send any news, comments, suggestions to africa@qz.comand support Cyclone Idai victims here. You can follow us on Twitter at @qzafrica for updates throughout the day.